The Dallas Cowboys, including the team’s coaching staff and owner Jerry Jones, decided to collectively kneel before tonight’s Monday Night Football game—but before tonight’s national anthem performance, while nothing was happening, in a flimsy attempt to please everyone by taking the imagery of protest but stripping it of any context or meaning. While the anthem was playing, they stood with arms locked. 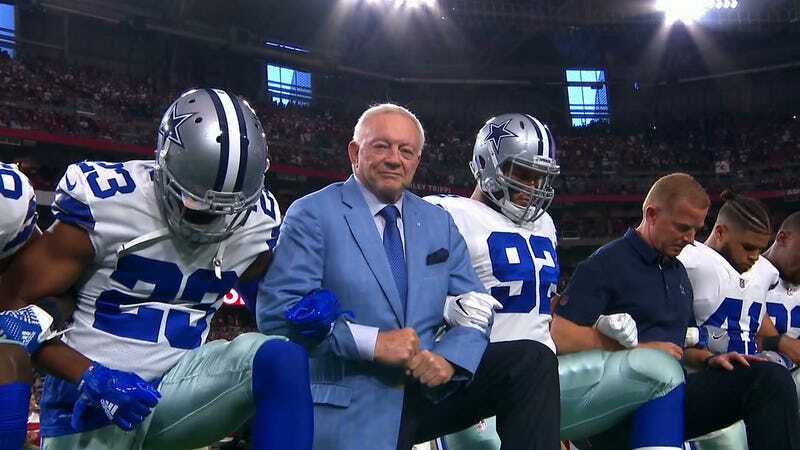 Congratulations to Jerry Jones and the Cowboys for finding the unity to pull off this craven move to diminish the meaning of this protest as a whole.